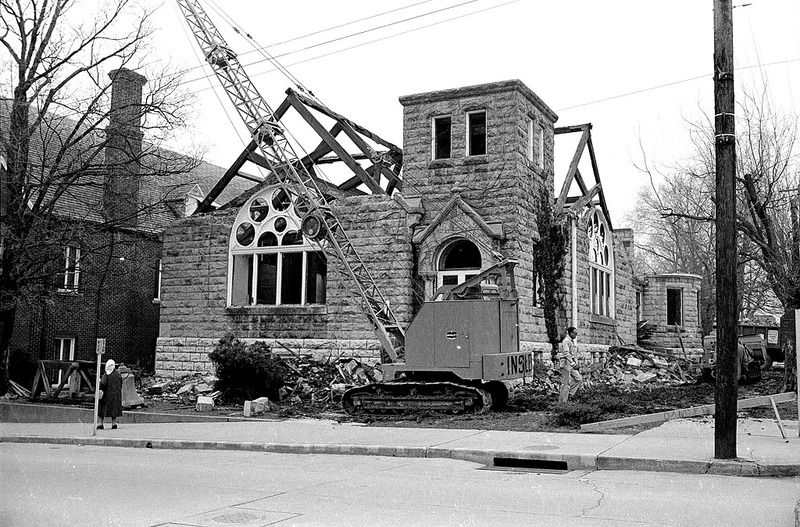 I captured the final days of the First Presbyterian Church located at the corner of Broadway and Lorimier, across from The Southeast Missourian, in March of 1965. The building was 63 years old. 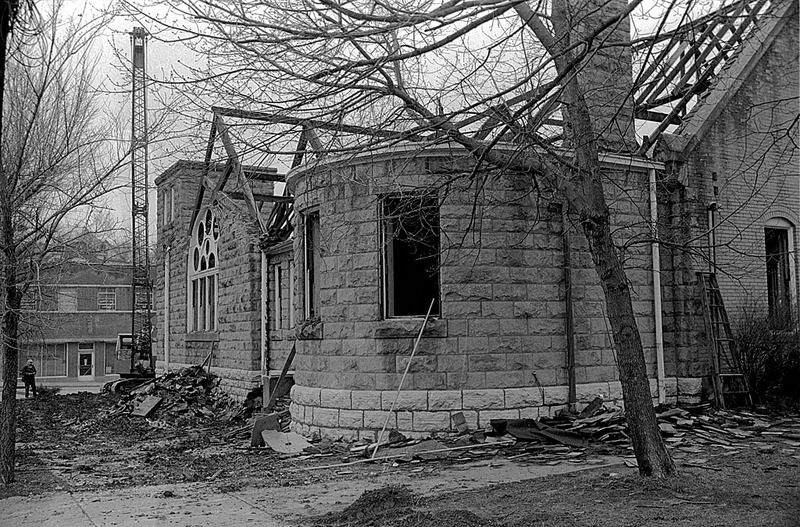 When I look photos of landmark buildings torn down in those days, I’m amazed at how little was salvaged. The 110-year-old bell that had called out firefighters and warned of jail breaks was saved to be reinstalled in the new church, but beautiful ornate woodwork was knocked down and hauled off. A March 30, 1965, Missourian story said that the building’s cornerstone was removed and would be examined later by a church committee comprised of Jack L. Oliver, Allen L. Oliver, Wendell P. Black, Mrs. Clyde A. McDonald and Mrs. Robert L. Beckman. 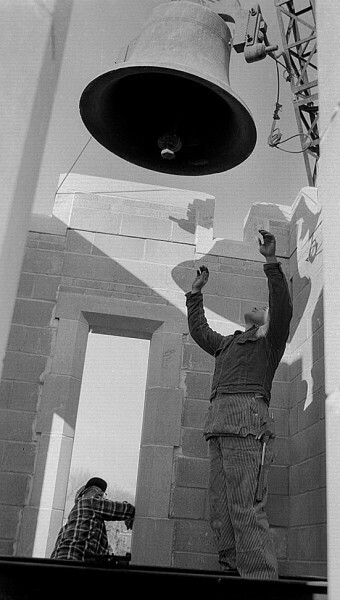 Before the end of the year, the new church far enough along that the bell could be reinstalled. 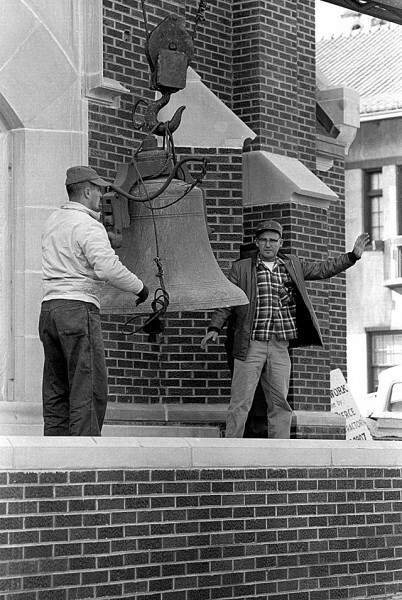 The Dec. 1, 1965, Missourian story chronicled a number of missteps before the bell was placed gently into its cradle. It had to be moved to a spot directly in front of the church. The boom on the crane had to be lengthened. A parking meter was in the way and had to be removed. 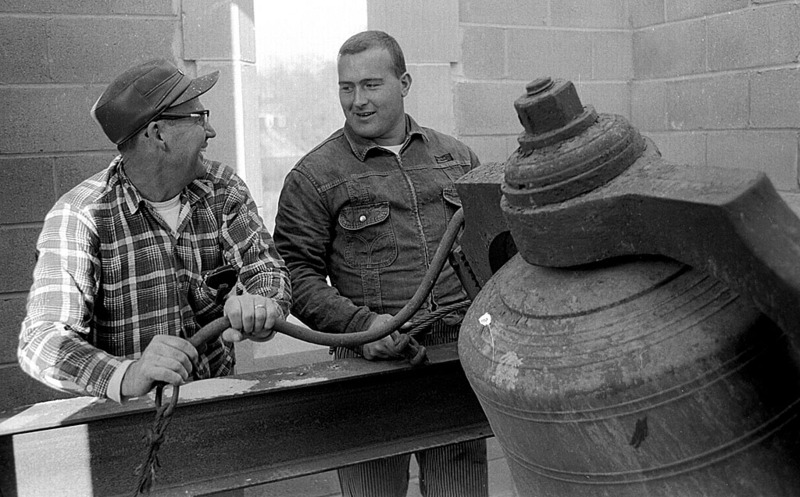 The crane ran out of gas and someone had to be dispatched to bring back five gallons to crank it up. The Missourian building is on the left. The Idan-Ha Hotel hadn’t burned yet, and the city was still using the silver star Christmas decorations. Anybody know when those were phased out and what happened to them? I always thought they were kind of classy looking. 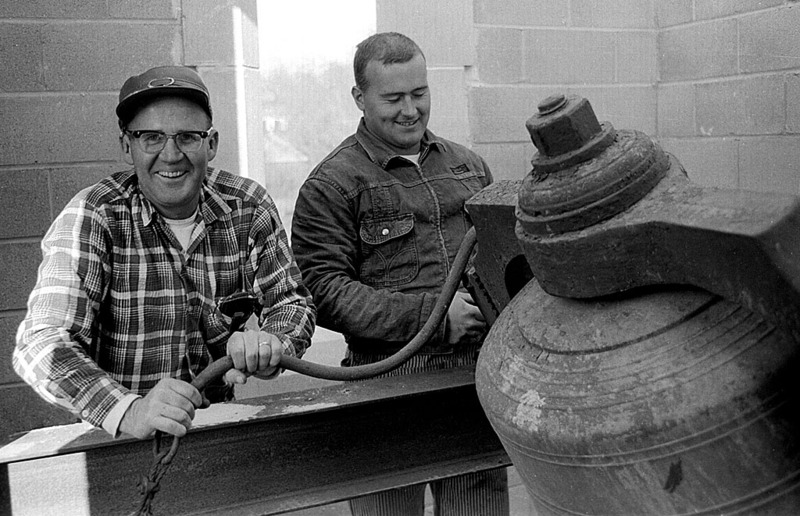 Pete Gibbar and Bill Vopelker, both of Perryville, were in the bell tower waiting for it to be lowered into place. 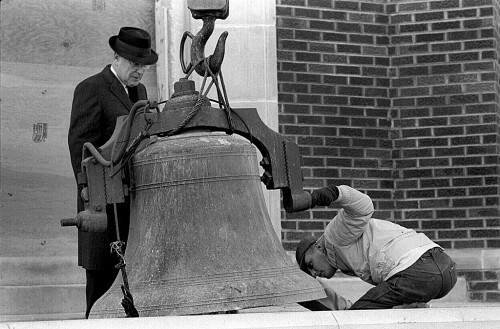 The bell landed right where it was supposed to and was quickly bolted into its collar. Pete and Bill were clearly happy when they rang the bell for the first time in its new home, the third of its existence. It was originally mounted in a wooden tower located on the courthouse side of the original brick Presbyterian Church. 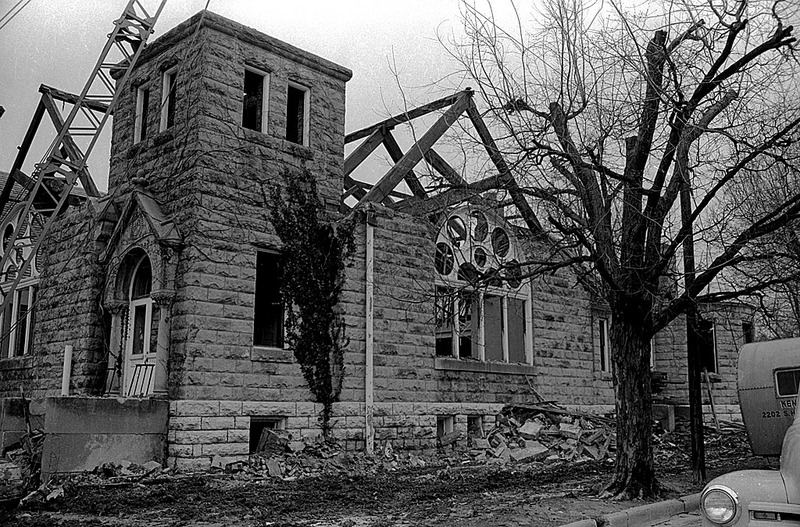 The tower and the church were torn down in 1904 to build the church that was just razed. The bell, which is inscribed, Jones & Hitchcock, founders, Troy, N,Y, 1855,” was originally cast for a St. Louis church, but it proved too heavy to be used there. Mrs. Addie McNeely bought the bell for First Presbyterian for $500. It’s 43-1/2 inches wide at the mouth and weighs about 1,400 pounds. 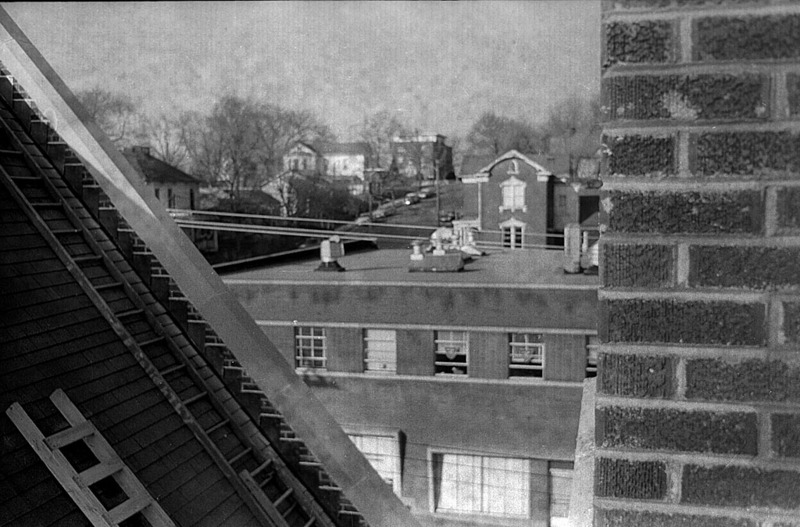 Here is a gallery of other photos, including a strange shot I took while changing film on my way up to the bell tower. I include it because it shows some of the buildings in the area. 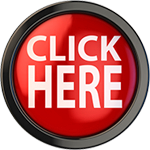 Click on any image to make it larger, then click on the left or right side to step through the gallery. 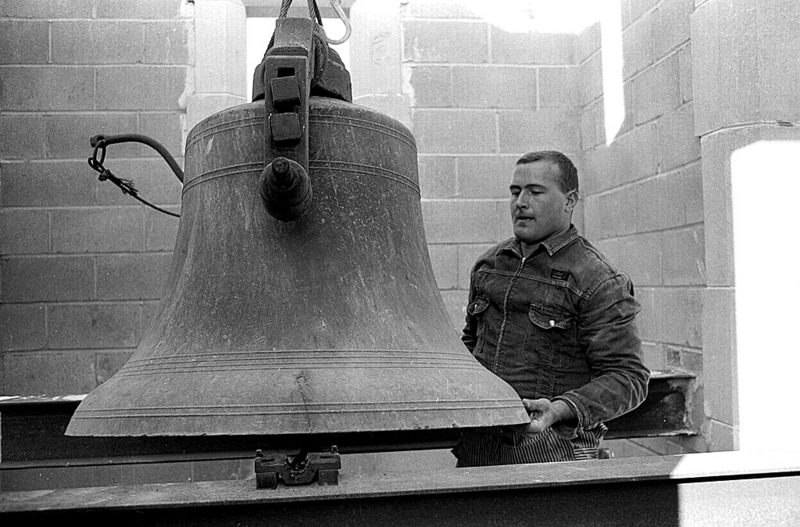 While cleaning out a shed at my Episcopal church in Orlando, I came across a 200-pound bronze bell — about half the size of the Presbyterian bell. I bought it on the spot and am glad I did. If you believe the old timers, it was the original bell from 1898. 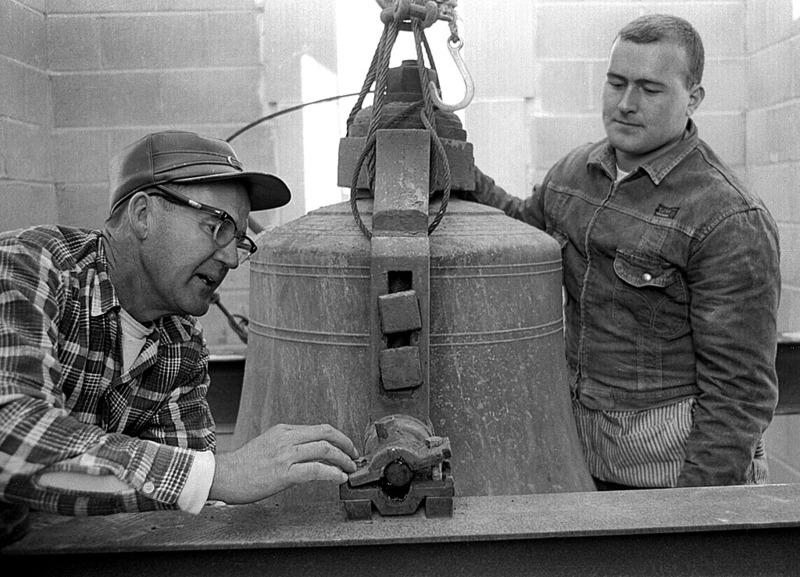 When the new, larger church was built in the 1980s, a parishioner donated a larger bell and the old bell was put in storage. 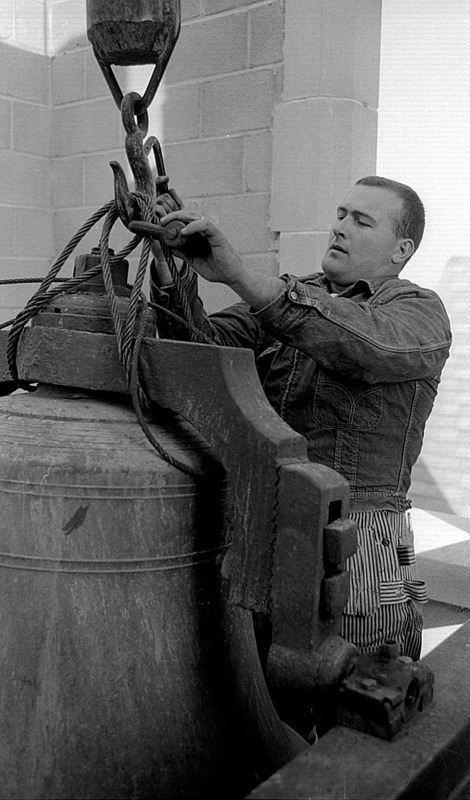 At some point, the rope to pull the bell was replaced with a pneumatic activator so that it could be remotely rung or rung by a timer. 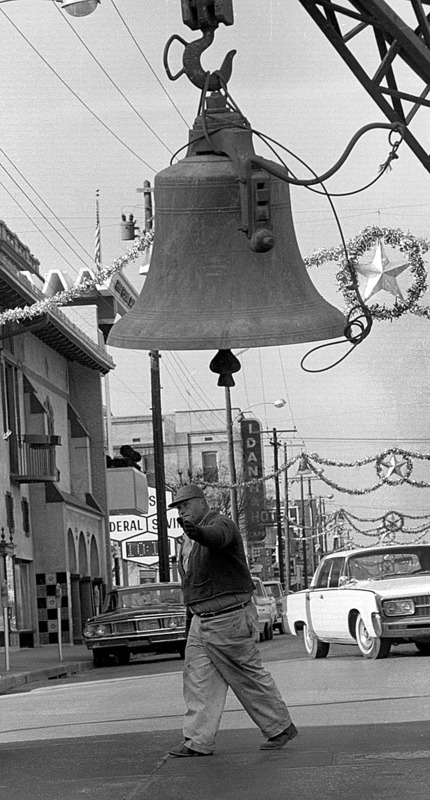 I’m sure that lowers the value of the bell but it still sounds great. One of these days, I’m going to mount the bell behind my house and ring it to call the kid home. 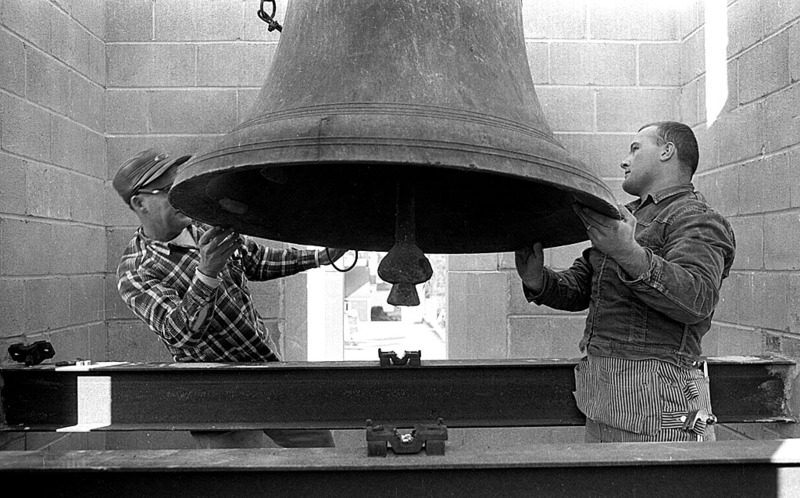 When struck solidly, you can easily hear the bell for many blocks. I was born,baptized and grew up with that builing. Some of my fondest memories of childood are being there. I am still a member and drive down from st louis to sing in the Choir with Mom twice a month. I rang that bell before church just a few weeks ago. The man in the fedora and long winter coat is Dr. C.E. 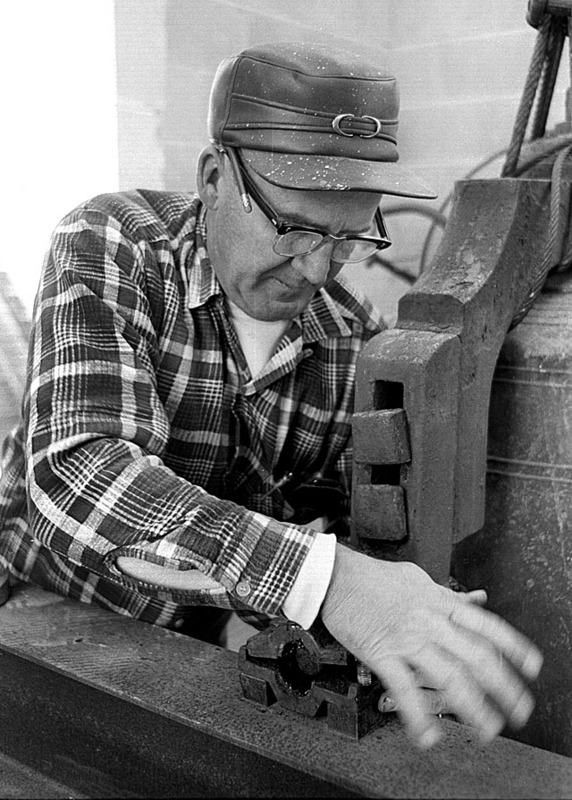 Mount, pastor at that time…a swell guy. I second that sentiment. Dr. Mount was a wonderful person and minister. Thanks for these wonderful photos. Ah, such memories. At this time of year, one thinks of the candlelight services on Christmas Eve. It is a wonder we didn’t burn the old sanctuary down! I remember going to First Presbyterian for Caticism(?) classes in late 50’s. We went in the side door and on into the Pastors’ study and were Christened on a Palm Sunday. Also, I remember, our Mother decorating for Eastern Star meetings & events in the fellowship Hall and the “Rumage Sales” that the ladies held. –Easter services…and , oh, my sister and I loved to hear the organ played! Thank you for the memories these pics recalled! 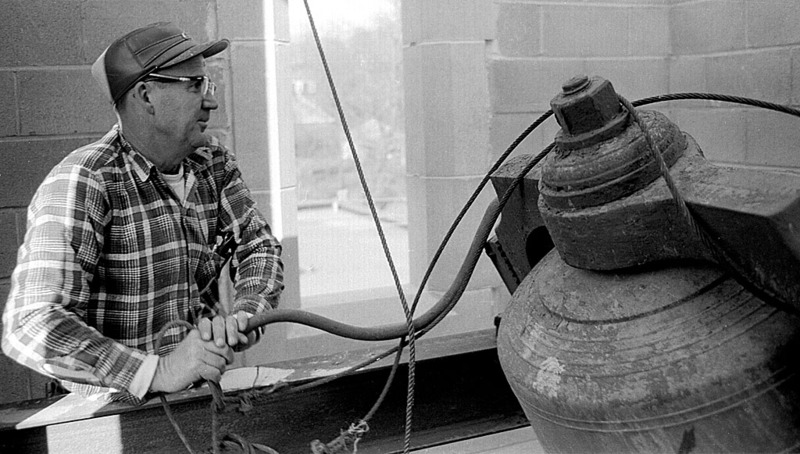 Many thanks for providing the pictures of the reconstruction of the First Presbyterian Church, including one of my dad. 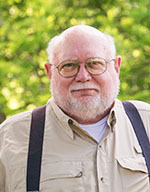 And many thanks to Van Riehl and Penny Hawkins for their kind comments about him. As I tell people who tell me what a good pastor he was, he was an even better father. Love all these pictures, Ken;especially the one showing the Idan-Ha Hotel sign in the background. I agree with your comment about the Christmas decorations with the star. I loved these so and have never seen any “modern” ones that compare- I may be wrong but it seems there were colored lights interwoven with them in some manner-anyone remember this? Next PostNext Fishing on Cedar Lake?